Hey everyone! Today I’m starting a new series I like to call, Spend or Save?. 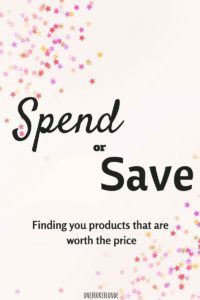 Every month or so I’m going to do a product review for an item that’s a little on the pricier side, and let you know if it’s worth the splurge! I know you might be thinking, “Dana, your blog is called One Broke Blonde. You don’t have money to buy expensive things and we come to you for affordable fashion”, and I hear you on that. However, just because I choose to buy affordable items 95% of the time, everyone likes to splurge once in a while 😉 I’m here to let you know whether these items are worth splurging for! I have been loving the fact that pom poms are so in this season. They’re on shoes, keychains, sweaters, and hats! 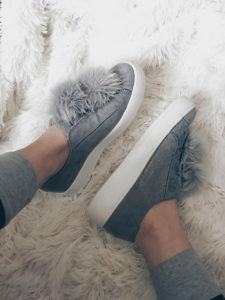 I’m a sucker for anything soft and fluffy, so when I saw that Steve Madden had hopped on the fluffy pom pom train, I was very excited. Originally these sneakers are about $90, which I had no intentions of spending on a sneaker. However, when Black Friday came around these babies were on sale for $54.99!! I was immediately sold. I knew it was a sign from the sale gods that I needed these shoes in my life. I saw the reviews that they were small and to order a size up, which I did. I was sooo excited to receive them in the mail that as soon as they arrived I ran up to my room, tore open the box, threw all the stuffing and tissue paper on the ground and slipped them on my feet. And I was a little sad. They are as adorable in person as I imagined they would be, so that isn’t the problem. I opted for the gray, but the shoes are available in pink and black as well! They are really soft suede, and the pom poms are super fluffy and attached well. The issue I have is the fact that they are SO NARROW. I don’t have unusually wide feet or anything, but these shoes are unusually thin. I also ordered half a size up because the reviews said they ran small, but I didn’t think I needed to order an entire size up! I do wish I had though because they rub the back of my heels pretty bad, so they are definitely not a shoe to wear if you’re planning on walking a lot that day. Overall, I would rate these shoes 3/5. They are so adorable and very well made; but the sizing is just not right. If I had super thin feet these would probably fit like a charm. Unfortunately though, I don’t and they are pretty uncomfortable. I ended up giving them to my sister because she has smaller feet than me, and they fit her more comfortably.